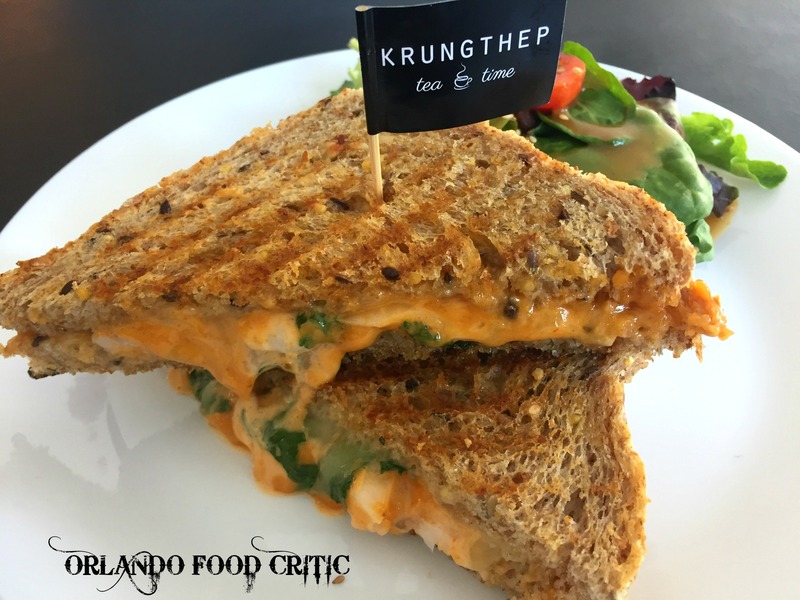 Krungthep – 1051 West Fairbanks Ave. Winter Park. The phrase “Never Judge a Book by Its Cover” could not be more appropriate than when you reference it to Krungthep. I guess like us, you have passed this block building a thousand times whilst travelling in and out of Winter Park and maybe wondered what the sign Krungthep meant but never bothered to stop and find out. Well take it from us, we all missed out! Krungthep (traditional Thai name for Bangkok) promotes itself as a Thai Sandwich and Tea Bar with a TWIST and boy what a twist. Let’s take the sandwiches first. Made each day with fresh ingredients, there are a dozen or so “Signature” sandwiches on their menu, served in your choice of Olde Hearth Bread Company bread, that can amaze your taste buds. 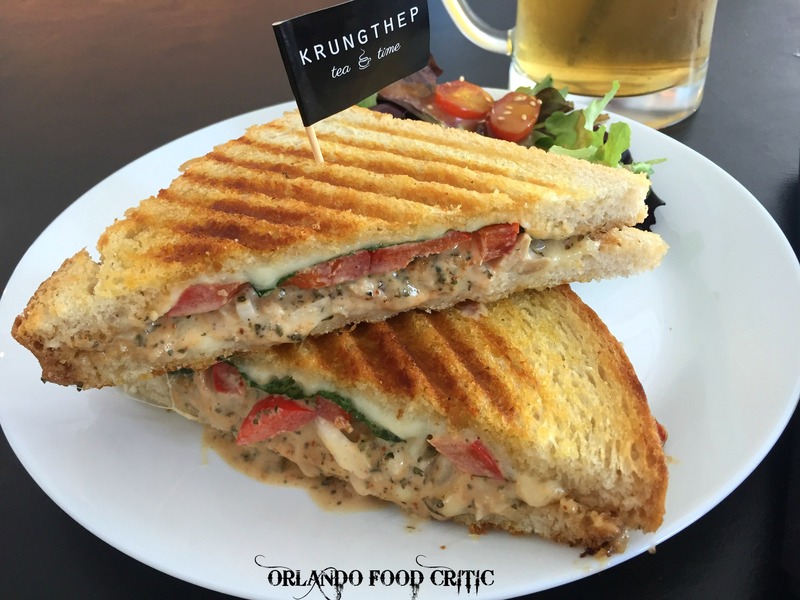 The adventurous fillings seem to blend perfectly with each other, as with Thai cooking, the balance of flavors is paramount to the success of the dish or in this case the sandwich. Gra-Prow Chicken – Chicken, fresh basil, onion, red pepper, mozzarella and spicy basil mayo. A superb toasted sandwich that holds a succulent mixture of the ingredients. Messy but great. Tomyum Goong – Marinated Shrimp, white onion, cilantro, pepper jack cheese and Tomyum mayo. Tomyum has developed from the soup most lovers of Thai food adore to being used as a hot and sour flavoring in a variety of food types. Never thought of combining pepper jack with Shrimp but it works. 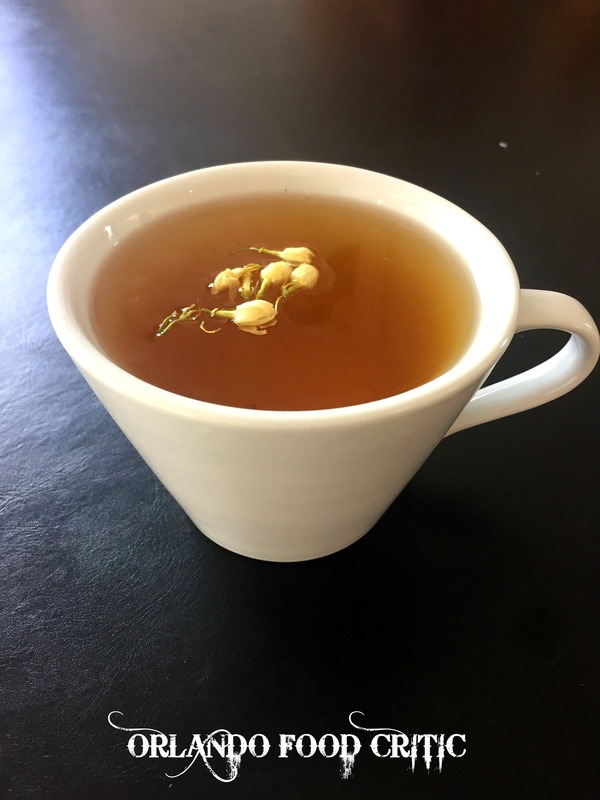 Now for the Teas – The Tea menu is immense and can be ordered Hot or Iced from a mind-boggling selection, and at a price point that will make you want to try more than one. Pomegranate Iced Green Tea – The delicate flavor of Organic Green Tea, really refreshing. Traditional Jasmine Tea – Classic Black Tea from China. Exquisite flavor with restorative qualities. Try and view the Tea selection as you would do when selecting a wine, the intricate flavor combinations have many similarities and bring tones and depth to each tea variety and combination. The flavors of the sandwiches and teas will surprise you, the quality will amaze you and the friendly service will bring you back.